ZP JashpurAawas Mitra Jobs Recruitment-2017: Zilla Panchayat Jashpur Gramin Vikas Vibhag has been released notification to recruit the B.E/B.Tech/Diploma Civil Engineer qualified Candidates for the available vacancies of Aawas Mitra under Pradhan Mantri Awas Yojna. 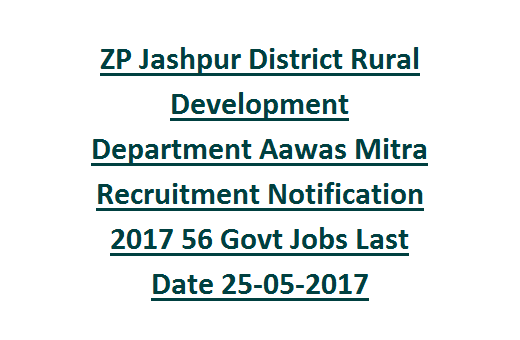 There are total vacancies available in this ZP Jashpur Aawas Mitra Recruitment. These vacancies are contract basis only for one year. If still recruitment is needed then it will be increased as per requirement. This is the scheme where Central government funding for the people who don’t have own house. Eligible and interested candidates can submit application form along with all testimonials on or before closing date of 25-05-2017 by 05:30 pm through Speed or registered post. Selection for these Aawas Mitra vacancies will be based on purely on merit in Intermediate/HSC and B.E/Diploma. Last Date to reach the application form to "Chief Executive Officer, Zilla Panchayat Jashpur, Jashpur District, Chhattisgarh" on or before 25-05-2017 by 05:30 PM. 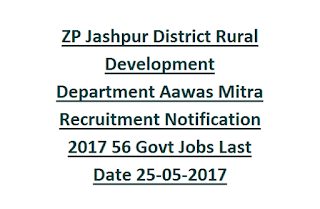 There are total 56 vacancies available in ZP Jashpur Rural Development department recruitment. These vacancies are purely contract basis of one year or based on project. Cluster wise vacancy details are given below. As on 01-January-2017 candidates lower age limit is 18 years and upper age limit is 45 years. Candidate must have completed HSC/Intermediate or B.E Civil or Diploma in Civil Engineering. Preference will be given to the B.E/Diploma Civil Engineering Candidates only. Selection for Zilla Panchayat Jashpur Aawas Mitra Jobs recruitment will be based on merit in educational qualifications only. Based on candidates marks percentage a merit list or selection list will be prepared and those candidates only called for the certificate verification or interview. Those who are will to work on contract basis as a Aawas Mitra they can submit their application form in a prescribed format along with the copies of all educational qualifications, Date of birth certificate, nativity certificate, ID and Address proof, Caste certificate and if any other related documents to the Zilla Panchayat Korea to be reachable on or before 25-May-2017 by 05:30 PM. See the official notification for Aawas Mitra Jobs of ZP Jashpur District Gramin Vikas Vibhag under PMGY.